One of the earliest references to the Dolphin is found in a document of 1454, but it certainly existed before then. ‘Le Dolphin’ can be shown to correspond with the south part of the modem Dolphin Hotel. It was often frequented by foreign merchants, and Italian seaman, whose ships were anchored in the harbour. Public entertainment was a regular feature of the Elizabethan period, and the yard at the Dolphin was a regular venue. Town records show payments being made to minstrels and other entertainers. Many alterations have been made over the centuries, so it is not surprising that Molly, one of the hotel’s six resident ghosts, walks the corridors with her legs below floor level. Remnants of the original medieval timbers, and stone vault remain within the core of the building. Collyer’s machines regularly ran between London and Southampton leaving the Dolphin at 5.45 o’clock in the morning. The fare was 16 shillings for insiders and 10 shillings for outsiders. It was in the late 18th. century that the Dolphin was substantially rebuilt with its handsome Georgian front, coaching entrance, and magnificent bow windows, which are believed to be the biggest in England. As well as being a coaching inn and venue for the winter assemblies, the Dolphin also contained genteel shops, and a subscription coffee room called Brimyard’s, where gentlemen could read both national and local newspapers. William Makepeace Thackary, an astute observer of human behaviour, wrote part of his novel, ‘Pendennis’, while sitting in the Dolphin’s magnificent bow windows. Another guest who frequented the inn was Edward Gibbon, the historian, while serving as a major in the Hampshire Militia. In World War Two, the Dolphin narrowly escaped destruction by enemy bombers. A bell-boy later described how he heard the church bells of the adjacent Holy Rood ring-out as the church was consumed in fire. 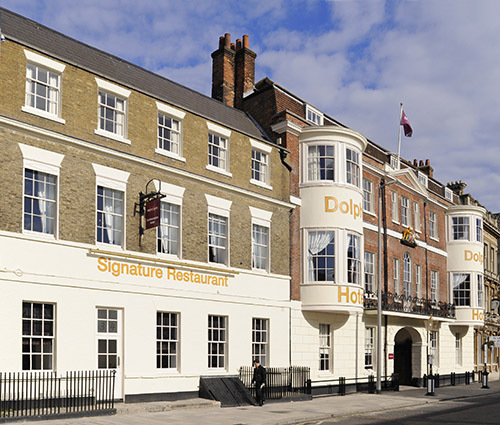 The Dolphin is closely associated with the history of Southampton. 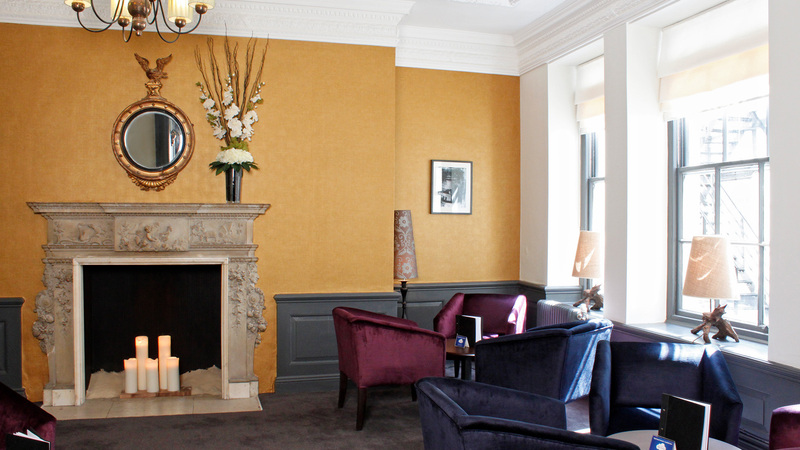 This wonderful hotel has recently completed a £4 million redevelopment programme and reopened its doors again on the 4th May 2010. Many thanks to Jake Simpkin 2010 for this summary.